The Neoprene Knee/Shin Guards by Damascus (model no. 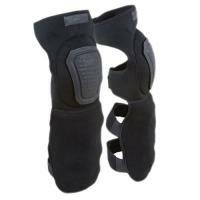 DNSG-B) are designed to offer ultimate protection and comfort for knees and shins. For ruggedness, the outer shell is constructed with durable neoprene with the knee caps that are further reinforced with Trion-X™ non-slip grips. For comfort, there are numerous elastic straps than can be easily readjusted and secured using Velcro® closures to get a secure custom fit around most limbs. For protection, shock-absorbent 10 mm foam is strategically placed throughout the guards with a second layer of polyurethane in the knee pads. The shin area is reinforced further with extra exterior padding to help deflect kicked up debris. Damascus' guards are adjustable and low-profile enough to be worn under or over other gear.